Since Mayor de Blasio took office, he has followed in the footsteps of the Bloomberg administration, insisting our community’s demand for a rezoning plan is “too ambitious.” Instead, he has pushed through a broad-sweeping citywide zoning that will further protect neighborhoods like the East Village, while leaving ourmajority Asian and Latino community a real estate prairie, as described by the New York Times. As long as we do not have the same protections, our community will face thousands more evictions. Enough is enough, we will not stand for being treated as second-class citizens! We are encouraged by the progress with 83 & 85 Bowery, as we continue to fight for equal treatment for our neighborhood, starting with adoption of the Chinatown Working Group rezoning plan. contact us atpeoplefirstnyc@gmail.com or (212) 358-0295. 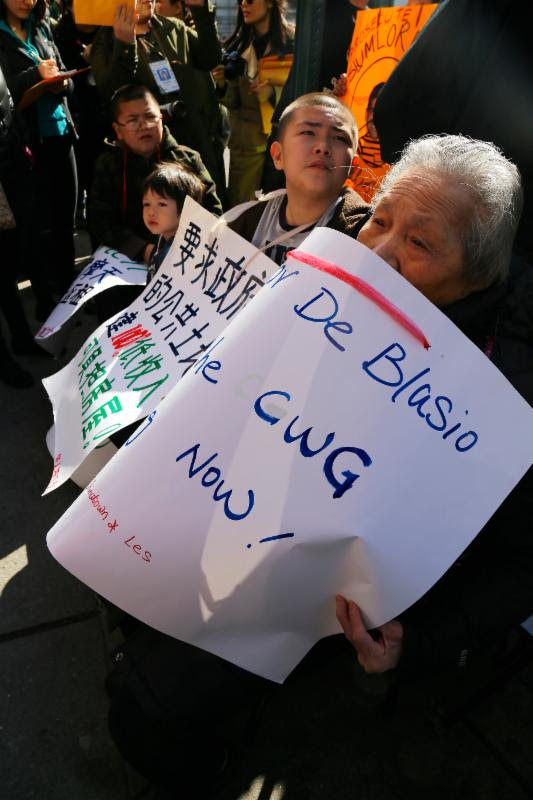 By Kavitha Surana: More than 100 Chinatown residents and their supporters crowded onto the sidewalk in front of 83 and 85 Bowery yesterday afternoon, marching around the block and gumming up traffic. The rally was part of the Coalition to Protect Chinatown’s ongoing effort to draw attention to tenant harassment cases and push for height limits and rent stabilization in the neighborhood. Embattled tenants of 83-85 Bowery are still struggling against their landlord of three years, Joseph Betesh. The Dr. Jay’s magnate purchased these adjacent tenements back in 2013 alongside ten other Bowery buildings in a blockbusterportfolio deal valued at $62 million. It didn’t take long for the alleged harassment to begin. Holdout tenants subsequently organized to fight Betesh and his purported inaction in repairing the structurally challenged buildings. (This is a common harassment tactic by slumlords.) 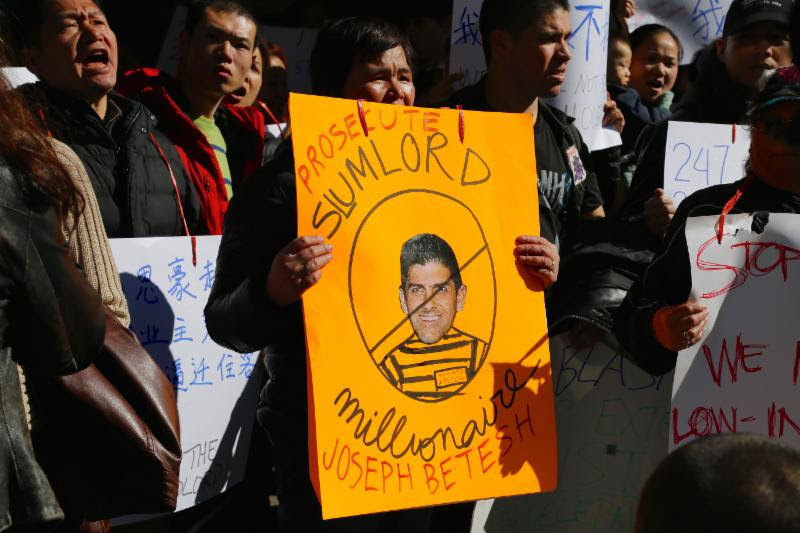 The activists are now demanding the city take action to “bring criminal charges against millionaire landlord Joseph Betesh.” A rally was held yesterday to gain visibility and support for the cause. Hundreds of supporters were reportedly in the ranks. By Aidan McLaughlin, Nicole Hensley: Dozens rallied against a slumlord millionaire accused of pressuring low-income tenants to vacate 83 and 85 Bowery. Protesters chanting and marching outside the Manhattan apartments at 4 p.m. Tuesday blamed landlord Joseph Betesh for letting both buildings fall into disrepair. The city has already ordered sections of the dilapidated buildings vacated. by Jim Dwyer: Stacked on the chipped tile floor of the vestibule at 85 Bowery were 59 boxes, each addressed to John Doe or Jane Doe. Modern moneyed New York had arrived at a rickety remnant of the 19th-century city via express mail. Inside boxes were lawsuites filed by a developer who wants the tenants out of 85 Bowery and the building next door, 83 Bowery. Details: Hundreds are expected to rally in support of residents of 83-85 Bowery to demand the City bring criminal charges against millionaire landlord Joseph Betesh, real estate mogul and owner of retail chain Dr. Jays. Tenants and community members will be joined by the New York City Public Advocate, Letitia James. In April 2015, Betesh sued one of the tenants, in hopes of evicting all residents of the two buildings. Recently, the tenant’s legal case has progressed favorably. The landlord dismissed the housing court eviction case and was told by the judge to pay the tenant’s lawyer’s fee. However, the landlord has refused to fix the building, instead using the disrepair as an excuse to harass and evict all of the tenants. The tenants have come together, vowing not to give in until they win. 83-85 Bowery tenants are in a similar situation as most residents in Chinatown and the Lower East Side. Due to recent discriminatory zoning policies, the neighborhood has become ground zero for displacement. Even many residents with rent-stabilized units are being forcibly displaced by landlords who use various underhanded tactics to evict tenants. That is why supporters are calling on the City to adopt the Chinatown Working Group rezoning plan. This plan would introduce protections such as contextual height limits to stop slumlords like Betesh and corrupt companies like Extell Development Corp. from building high-rises in the community. It would stabilize rents and real estate taxes, and enable the tenants of 83-85 Bowery and other low-income tenants in the community to stay. The Coalition to Protect Chinatown and the Lower East Side has invited all of the presidential candidates, along with Mayor Bill de Blasio, to attend. email peoplefirstnyc@gmail.com for more info!